It's taken a heck of a long time, but finally the 10 year ESA Rosetta mission has successfully deployed its Philae lander onto the surface of Comet 67P/Churyumov–Gerasimenko (1). Philae bounced a few times during the arduously long landing (which was more like a highly sensitive docking procedure due to the almost complete lack of gravity on the comet). Perhaps this will make the Guinness Book of Records for the longest landing in history? Even if the lander has a short shelf life due to the crater wall shadow it now finds itself in, we should still discover a lot more about the composition of comets (2), and thus the conditions of the early solar system. Comet 67P is a short period Jupiter-class comet with an orbital period of 6.45 years (3). Unlike the long-period comets, which enter the solar system from the Oort Cloud or beyond, this comet is now very much at home among the planets, having had its orbit affected by a close pass with Jupiter in 1959 (4). Presumably, at some point in the past it came into the planetary zone from beyond, as an outer period comet. 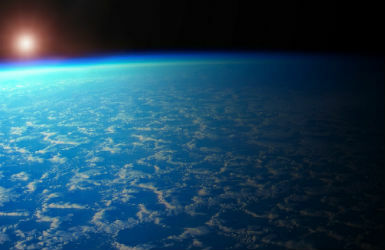 It has been thought for a long time that the Earth's water originated from comets. The argument goes that the Earth's relatively close proximity to the Sun means that its early water should have been driven off with the other volatiles, burned off the primordial surface of the Earth by the Sun's heat. Yet, the Earth is covered in oceans, providing something of a mystery which Comet 67P may help to solve. "All comets previously studied have shown deuterium levels around twice that of Earth's oceans. If comets of this kind had collided with Earth, they could not have contributed more than a few percent of Earth's water. In fact, astronomers had begun to think that meteorites had to be responsible, even though their water content is much lower. Perhaps Comet 67P will have water like Hartley 2, or perhaps more like the other comets whose isotopic ratio of water has been determined. But there's another issue here that is not being address, that is literally staring us in the face. The other major assumption at play here is that comets are 'dirty snowballs'. But the most cursory look at Comet 67P from the Rosetta spacecraft indicates that it looks more like a standard asteroid. 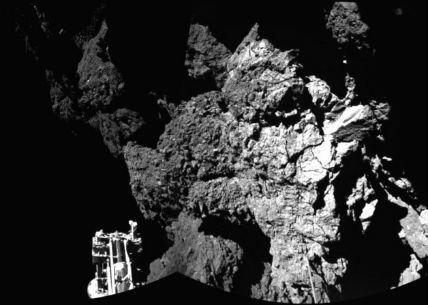 Now we have imagery of the the surface from the Philae lander, and that looks even less like a dirty snowball. 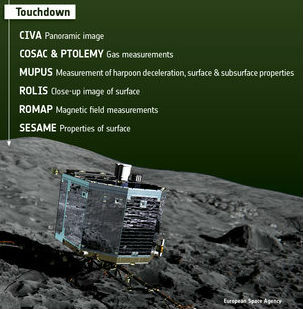 In fact, it looks more like the lander is sat in a quarry. There's no ice in sight! Now, you might argue that this short period comet has been through its perihelion pass enough times for its ices to have been driven off by the Sun's heat. But, that was not the expectation when Rosetta was first sent. 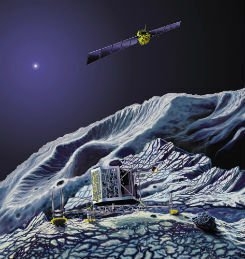 In an Open University paper based upon a lecture given at a planetary science conference in Texas in 2006 (6), the official artist's impression of Philae and Rosetta shows a comet surface which is covered in ice and snow (see below right). Such an image reflected the 'dirty snowball' view of the composition of comets widely held at the time. 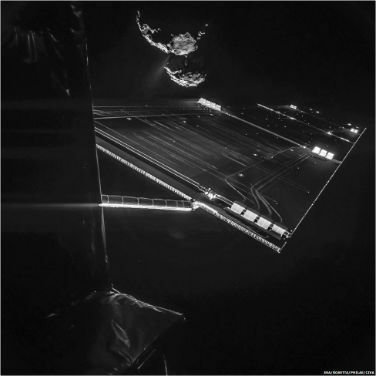 Author Al Cornette has pointed out how the Philae lander's harpoon system also indicates what was assumed about the surface of the comet when the mission was in the design stages - that there would be plenty of ice to attach the harpoon to when stabilising the lander's position (7). Instead, the comet looks more like a barren rock, one impervious to the harpoon's attentions. Its coma must presumably be sourced from ices within, sublimating during perihelion and violently emerging from the comet in a process known as 'outgassing'. This is in keeping with findings of comet Hartley 2, where outgassing of volatile carbon dioxide spews water ice out into space (8). Here's the thing. If comets turn out to be small rocky worlds whose store of volatile ices make a very spectacular but short-lived show during perihelion, then it's very hard to see how they could have delivered enough water to the Earth to fill our oceans... They simply don't have enough water on board to do the job. That's above and beyond the issue created by the mismatch of isotopic ratios between earth and most of the comets analysed. The implication of this is that the Earth already had its water when it first formed. As we shall see in the next item, that is a realisation that is now taking hold in the scientific community. So, how is it that early Earth water was not removed by the the bombardment of the solar wind? Perhaps the Earth had a lot of water below the surface, which escaped the fate of the surface volatiles - but it would have had to have been a awful lot of water down there! Some geologists argue that astronomers have it all wrong, and that this is what really happened (9). Or, perhaps the Earth was not at that time located so close to the Sun, thereby allowing it to keep its water in a cooler zone. This is the creation story which Zecharia Sitchin has provided us with, based upon his reading of the ancient Sumerian texts (10). The Celestial Battle between the emergent, resplendent god Marduk and the watery monster Tiamat, as described in the Babylonian Enuma Elish (11), can be understood in cosmological terms as a description of a catastrophic event in the early solar system. Tiamat was the early Earth, a then larger world, covered in water, which was located where the asteroid belt is now. Marduk was a seething red planet of enormous proportions (likely a sub-brown dwarf, or Dark Star (12)) which crashed through the solar system in a similar way that comets do. It either directly impacted or caused a collision between one of its moons and Tiamat, causing the watery world to fracture, shedding its waters across the solar system and deflecting the main planetary remnant into the inner solar system, thereby becoming the Earth. Many of my readers will be familiar with this story, along with its various scientific implications. The reason I repeat it here is to emphasis the last part - the shedding of Tiamat's waters. The scattered debris from the fractured world became the asteroid belt (the Hammered Bracelet in the Babylonian epic) and also, of most importance here, the comets... Which means that according to Sitchin's 12th Planet Theory, the origin of Comet 67P, like Comet Hartley 2, might have actually been the early Earth! It is, as one might say, a chip off the old block. As strange as this may all seem, it does make sense of the complex picture emerging from scientific analyses of the composition of the comets, and their relationship with the waters of Earth. So, as with Hartley 2, we might find ourselves in the curious position of finding out that the comet Rosetta is orbiting around does indeed share its water with Earth. However, the lack of an abundance of cometary water, as seen in the images of these comets, implies that they are not dirty snowballs as previously thought, and that the late veneer theory is therefore found wanting. Not only do most comets not have the correct isotopic signature, but those that do don't hold enough of the stuff to fill the oceans. Frankly, scientists have been looking the wrong way down the telescope on this subject. Rather than the comets giving water to the Earth, it seems increasingly likely that the Earth gave birth to some of the comets. And, as we shall see next, the asteroids seem to share a similar origin. Water, water, everywhere... Is it possible that the early Earth was completely covered with deep oceans of water? Consider Jupiter's Galilean moons, Europa, Callisto and Ganymede. These perfect billiard balls appear to comprise of a spherical ice exterior under which lurks oceans internally warmed by the gravitational influence of the nearby gas giant. If Jupiter was brought closer to the Sun, then these moons would develop their own atmospheres, and their global ice caps would melt way, leaving global seas. Not unlike Kevin Costner's "Waterworld", that well known disastrous disaster movie. Might have earth once have appeared the same? This is all very well, until you examine the phrase "which formed in the same region of the solar system as Earth" (2) in any sort of detail. 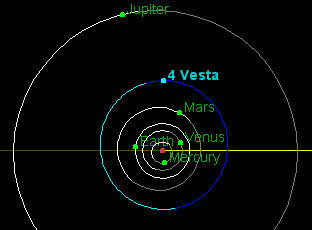 Many readers will realise that 4-Vesta is the second biggest asteroid in the solar system, residing comfortably in the asteroid belt between Mars and Jupiter. It is considered to be the last remaining rocky protoplanet of the kind that formed the terrestrial planets (5), and is thought to have formed before the Earth. How curious, then, that it should exhibit exactly the same isotopic hydrogen/deuterium ratio in its carbonaceous chondrites as the Earth! Is it strictly correct to claim that the Earth and Vesta formed in the same region of the solar system? Only in the broadest of terms - through a simple differentiation between the inner and outer solar system. If I was to be pedantic about it, which I am liable to be, I would point out that the Earth is not actually in the asteroid belt. It's not right to say that these two bodies formed in the same region - at least, not according to the mainstream thinking about the origin of the solar system, anyway. Yet, that's what the scientific finding implies. The author of the Daily Galaxy article is brushing over this tricky problem, as might be expected when the data creates an uncomfortable anomaly. Furthermore, why would they have the same isotopic ratio if the Earth and 4-Vesta formed at completely different times in the history of the solar system? Surely the conditions of planetary formation would have changed over time? All we can really assert here is that the common isotopic ratio implies a common origin, which in the maelstrom of the early solar system implies a greater degree of intimacy than scientists are currently willing to consider. So, one might draw a rather more interesting conclusion from this finding than the realisation that the early Earth was a water-world, as fascinating as that might be. That is, the origin of Earth and 4-Vesta were actually directly connected. They were both, quite possibly, part of the strewn debris field of the mythical planet Tiamat, rended asunder by its calamitous encounter with the Dark Star some 3.9 billion years ago. I suggest that this latest science adds to the growing database of evidence supporting such a scenario. An ancient site in Turkey, close to the Syrian border, has turned up a surprising new archaeological discovery - a previously unknown and rather bizarre looking god set in bas relief. While the figure's torso has a Romanesque feel to it, implying Jupiter Dolichenus (in keeping with the temple at the archaeological site), or perhaps even Mithras emerging from rock, the accompanying symbolism harks back to ancient Mesopotamia. In particular, the god appears to emerge from a melange of symbols, including a trinity of crescent moon, Sun-rosette and 6-pointed star. The juxtaposition of crescent and Sun is often seen in symbolic imagery associated with Baal-Hadad (a Middle Eastern Canaanite god from 2nd Millennium BC Syria), or the even older Mesopotamian sun-god Shamash. 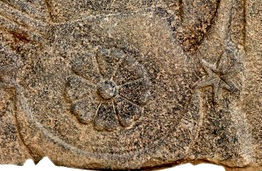 This symbolism clearly pre-dates and seems to have been influential in the emergence of the Star and Crescent of Islam (although the accompanying star seems to have been dropped). Curiously, though, the celestial imagery is to be found at the god's feet rather than in the sky above him. Even more curiously, the god appears to be emerging from some kind of exotic plant-life or perhaps even half-man/half-fish imagery in keeping with the Babylonian god Oannes described by the priest Berosus. Alternatively, is the god depicted as a Naga, the Hindu serpent deity? This serpent-god answer seems the most plausible to me, as one might imagine his flowing serpent like body flowing around to the snake-like tail to the immediate left of the central figure. Often, the astrological symbols here are associated with a large serpent in Babylonian motifs, again implying a Mesopotamian origin for these symbols. There's great uncertainty here, and, to be honest, your guess is as good as mine when trying to unpick this bizarre gnostic creation. But just to add a little further speculation to the mix, the astrological symbolism deployed here can also be alternatively interpreted as a quixotic celestial event. That is, the symbolism depicts an anomalous event in the sky whose central importance provided impetus to project it down through the generations of ancient history - the appearance of an aura-wrapped, almost comet-like Planet X and one of its main moons. In which case, the monstrous god central to this mysterious motif is closely associated with the appearance of this 'Dark Star' event might be better understood as one of the Anunnaki, this time with a distinctive Roman countenance, emerging from the arriving celestial ferry Nibiru. Besides a possible binary star to our sun is there anything else that could feasibly have caused pole shift here on earth in the past. Science has proven the Earth has gone through pole shift right . Multiple times. If people don't want to believe that then what did cause past pole shifts, proven pole shifts if not the binary twin to our own sun. So, pole shifts - the magnetic poles shift about constantly, as I'm sure you're aware, and there are a great many localised disturbances in the Earth's magnetic field. Every so often, as you say, there's a total swing about from north to south, and I guess the reason for that is mysterious. So, perhaps a major solar event causes a large magnetic disturbance in the solar system's overall magnetic field - a redistribution of the 'neutral sheet' has been suggested before now. This might then create a realignment of Earth's own field. Or maybe the iron core at the centre of the Earth swings around like a ball internally, taking the magnetic field with it. Or perhaps the movement of a Dark Star binary companion or massive Planet X through the solar system might cause a realignment if the object were to pass relatively close to the Earth. Or maybe something totally off the wall, like Charles Hapgood's crustal displacement theory, whereby the Earth's crust periodically twists about (again, maybe because of a local cosmic gravitational disturbance) creating the dynamic where the magnetic field stays in the same place (because the core is unmoved), but the crust swings around. The upshot of this would be that there appears to have been a reversal of the magnetic pole, but actually there was a tumultuous shift of the Earth's crust towards 180 degrees merely creating that appearance, with respect to the local recorded magnetic patterns on the surface. This is a daring, if slightly potty theory, but Einstein liked it, so I guess it might have some traction after all. My good friend Martin sent me this link to a rather enigmatic series of drawings and artwork found in an old case in a dumpster recently in the U.S. Knowing my interest in the Book of Ezekiel (featuring in the title of my novel 'Ezekiel One'), he knew I would find the content of this suitcase fascinating. The strange mix of material reminds me a little of the mysterious Voynich manuscript, although this more contemporary set of artwork is more grounded than that. Except for the extra-terrestrial drawings, perhaps, which are imaginative and reasonably skilled in their draughtsmanship. It's a shame that the artist did not share his/her work during their lifetime - the collection seems to have been thrown out as part of a house clearance. 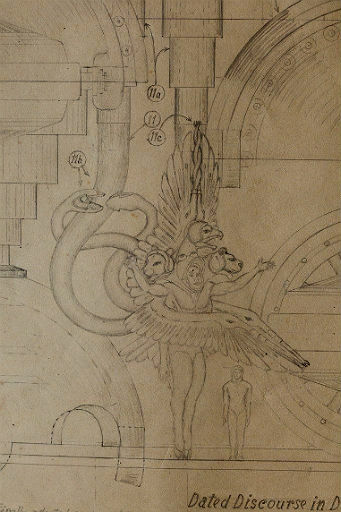 One of the drawings is dated to 1939, and the artist seems to have a strong scientific or engineering background. Their interest in UFOs, and accompanying angels/extraterrestrial visitors seems to have been triggered by an encounter in the 1960s, an account of which is included in the collection. Check out the links below for the images themselves. Back in May's Dark Star Blog (http://www.andylloyd.org/darkstarblog14.htm) I introduced readers to my friend Simon's curious habit - that is, the one he put on to become the Emperor from Star Wars! He made for a surprise hit at the MCM Comic Con Sci-Fi convention in Birmingham, ganging up with official members of the UK Garrison to plot their return to power across the galaxy. Well, it is a little known fact that the Dark Star family stable has its own shining light in the curious world of Comic Convention theatrics. Dark Star Bro, aka Mikey Lloyd, has appeared at numerous conventions in England in various guises: Captain America, Hawkeye and Cyclops. Here's an image of his latest incarnation - that of the notorious comic arch-villain Judge Death. This character has yet to appear in any movie, but was about the coolest bad guy ever in 2000AD's original Judge Dredd comic strips. As you will appreciate, this remarkable costume was not exactly knocked up in his shed, but instead required months of serious expert attention to perfect. 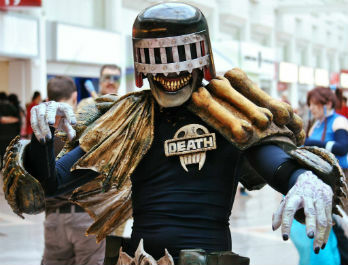 He recently debuted the new look at November's Comic Con event at Birmingham's NEC, and I'm quite sure he'll be popular among Dredd fans across the country as he tours around the conventions, widely showcasing his trademark pestilence and woe! Dark Star Dad also has a penchant for dressing up in unusual outfits - but in his case they generally involve aprons, suits, white gloves and other Masonic regalia. Perhaps it would be fun if they swapped around every so often? Judge Death would make quite an impression down at the Lodge, methinks.